There is no better way to see Germany than with Romantic Road trip. This picturesque route takes you through the forests, mountains, and small storybook towns of Bavaria. 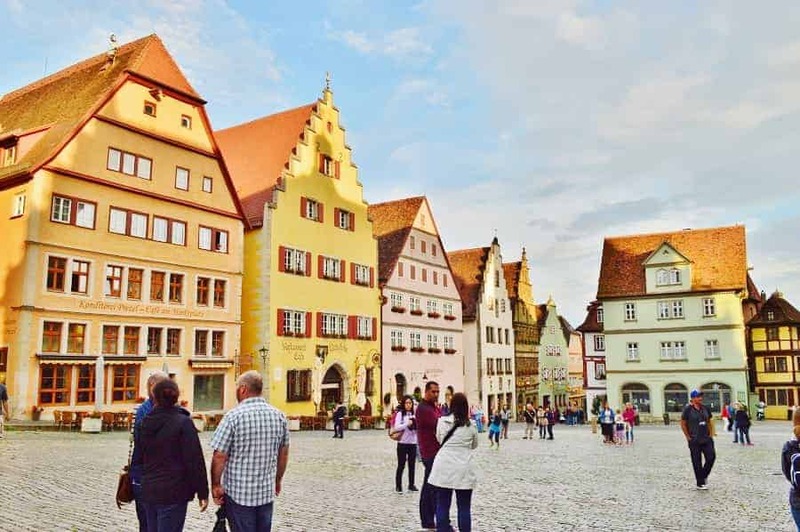 While it can be driven in a day, we suggest you take your time so that you can fully experience everything on our Romantic Road Germany Itinerary. If you will be driving in many different European countries, you may want to get an International Driving Permit (IDP). This is a Driver’s License that is valid for over 150 Countries. If you are sticking to Germany, you’ll be fine with your own standard Driver’s License to drive along the Romantische Strasse. If you’re planning on renting or leasing a car in Germany you will want to make sure that you are ready for driving a stick shift (manual) vehicle. You may be able to find an automatic, but it will cost you more and you will have less selection. I would also recommend that you prepay for GPS. No car? There are bus tours that run almost the full length of the Romantische Strasse. If you are looking to train it, you will be disappointed as there are only so many stops along the route and you would miss some really great places. Wondering where you should stop & what sites you should take in? 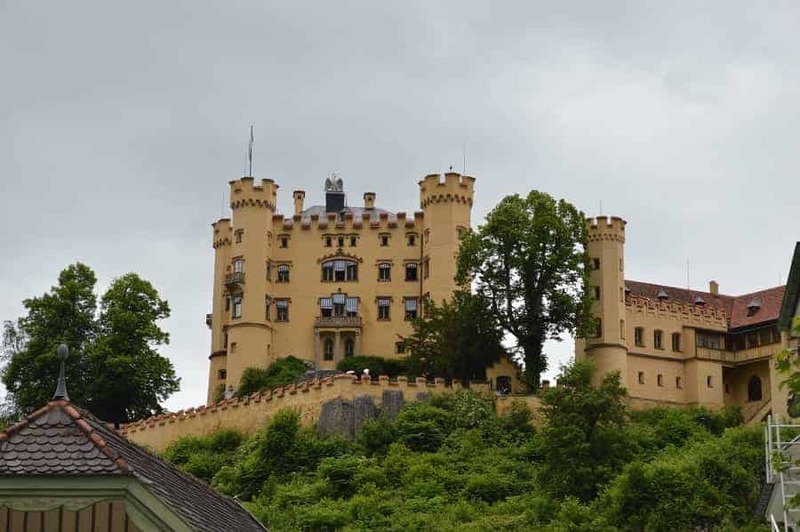 We’ve got a great list of things to do, see and eat while on the Romantic Road Germany. Day 1 : Start in Munich and head south to Würzburg where you can tour 18th-century Residenz palace & Marienberg-Fortress before heading on to Creglingen. There, you will want to spend time about an hour at Herrgottskirche and possibly the Thimble Museum. This should put you in Rothenburg ob der Tauber in time to grab dinner before checking into your hotel & possibly doing the Night Watchman Tour. Day 2 : Explore more of Rothenburg during your day before driving onto Dinkelsbühl & then Augsburg where you should spend the night. Day 3 : Spend the morning in Augsburg seeing the sites in this German Renaissance town before heading to Weis to visit Wieskirche and lastly Neuschwanstein Castle. Plan to stay overnight in nearby Füssen. Day 4 : Explore all Füssen has to offer before heading on your way to your next destination. 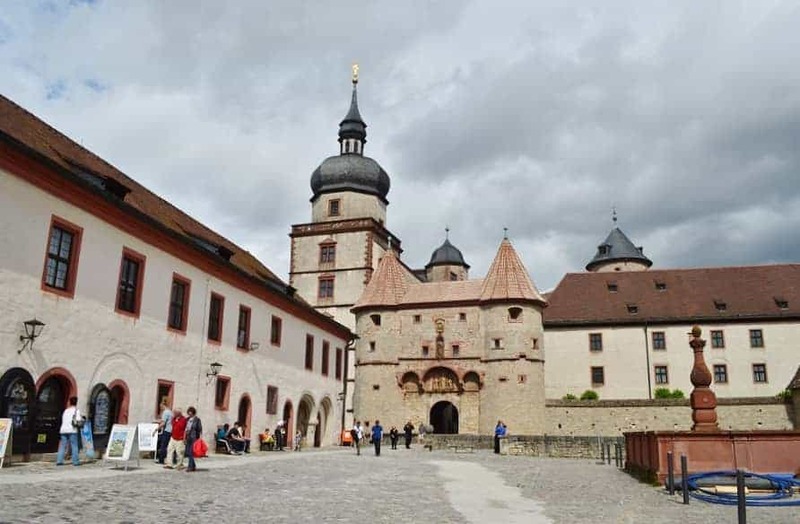 Take time to visit Marienberg-Fortress. Originally, this was a site of a Celtic castle at this site. Later, the first Würzburg church was erected and in the 13th century, it was made into a fortress. The fortress was expanded and renovated several times during the Renaissance and Baroque periods. The best part of Marienberg-Fortress is the view it gives of the city of Würzburg. While coming through this small town along the Romantische Strasse, be sure to stop at the Herrgottskirche. The story behind this church being built is that a farmer in the mid-14th century claimed to have found an undamaged communion host in the field that he was plowing. Believed to have been a sign, the community built a church on that field. Inside the church is one of the most famous wooden altar pieces designed by Tilman Riemenschneider in the middle ages. In my opinion, this is the most quintessential storybook town on the Romantic Road in Germany. It is like time stopped and all remains as it once was. It is probably because this town was spared from the destruction of WWII due to the fact that an American general had once stayed here for vacation and fell in love with it’s charm. If you can, be sure to stay overnight here and experience all Rothenburg has to offer. With 16 fortified towers and several authentic city gates, it is one of the only remaining walled medieval towns in Germany. Dinkelsbühl is is your quintessential storybook town and worth spending time seeing all the sites. The largest city along the Romantic Road in Germany, Augsburg is the home of German Renaissance and Rococo style. Take time to see the Rathaus (Town Hall), the Perlachturm (Perlach Tower), and the Schaezlerpalais (Schaezler Palace). 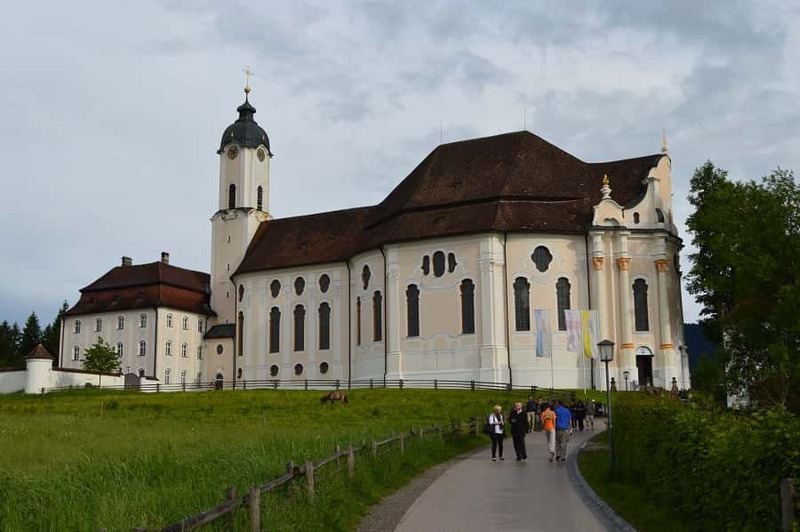 The most important site to visit here is Wieskirche. It is a famous pilgrimage site due to the fact that in 1738 it is said that tears were seen on a dilapidated wooden figure of the Jesus. Many who have visited and prayed in front of the statue have claimed that they have been miraculously cured. The church interior is stunning and ornate. Plan on spending about 30 minutes or so checking it out. Admission is free, but donations are accepted (and encouraged). 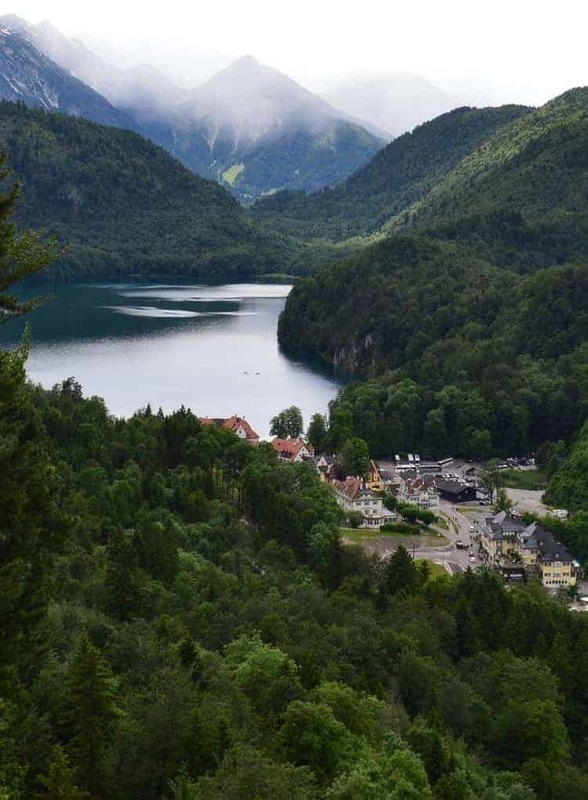 This village in Bavaria is the where you will find Neuschwanstein Castle and Hohenschwangau. Neuschwanstein is the fairy tale castle of Mad King Ludwig for which Cinderella Castle in Walt Disney World is designed. While you can take pictures outside of the castle and the views from the castle, you cannot take pictures inside. While beautiful, King Ludwig only lived in Neuschwanstein for about six months. 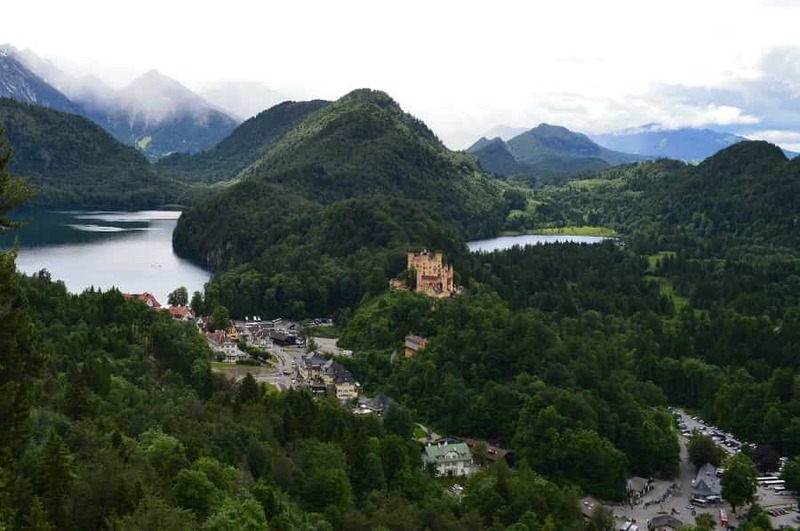 He actually grew up in Hohenschwangau Castle which is visible from Neuschwanstein. The castle can be visited on its own, or as part of a combined ticket with Neuschwanstein. Which ever way you choose to see one or both, be sure to book your tickets in advance to avoid the long lines. The end of the Romantische Strasse (or beginning) leaves you right at the edge of Austria and the alps. This beautiful lakes against the backdrop of mountains (and castles) is simply breathtaking. You’ll find the old town charming with plenty of things to do to fill your day. 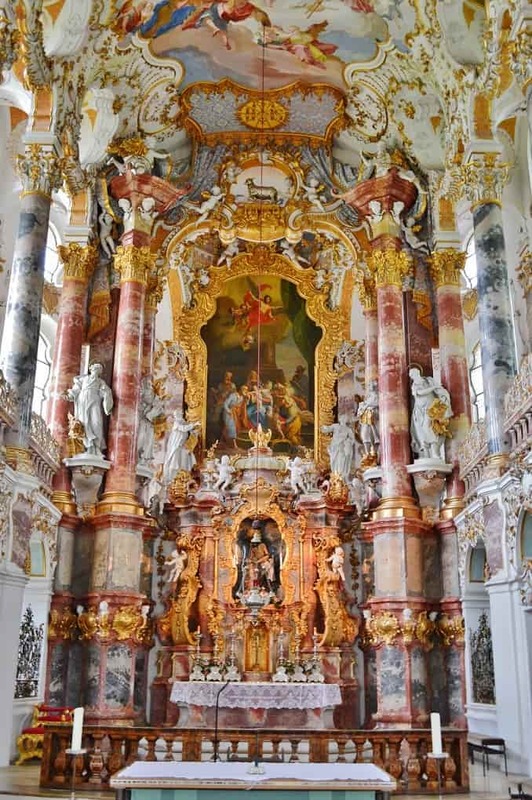 Check out the baroque churches and Bavaria’s oldest preserved fresco (circa 980). If you are concerned about driving in Germany, you shouldn’t be. It is as easy as it gets and the fact that you can go at a leisurely pace through each town make it the perfect trip for both couples and families! Use this Germany Road Trip Guide . Have you driven along the Romantic Road Germany? What was your favorite stop? Love the Romantic Road, you picture of Rothenburg makes it look like a movie set! Look at those carvings! So intricate and it’s amazing that they are so old too. I wonder if we could even carve like that now with machines? I LOVE Germany. It was one of my favorite roadtrips and I wish I had a chance to do more of the country. These little towns are so dang cute! I have been planning to visit Germany this year and hopefully, I’ll see Neuschwanstein castle too. Honestly coming from India, wasn’t sure of taking a road trip in Europe, but I guess now it’s time to change the tracks. You’ve truly inspired me with your gorgeous photos and being a WWI buff, I’m surely going to visit Rothenburg ob der Tauber. I didn’t know that this road existed! Those towns are spectacular. Do they seem to be overrun with tourists or is it mostly locals? How do they feel about tourists? I definitely want to check out the castle that is the inspiration for Cinderella’s castle. Friends showed me pictures of it from a ski mountain. Apparently you can ski with some incredible views of that castle. What a lovely name, “Romantic Road”! I must confess I had not known about this before. Thank you for sharing! I love all of your beautiful photos! This makes me want to visit Germany so bad (especially the Alps). Pinned this info for later! This is a great way to experience Bavaria. I once had a horse school owner who told me she came from Bavaria – which she was quite adamant had nothing to do with the rest of Germany. Would love to meet some characters like her and see these site you wrote about. Thanks for posting. Thanks for sharing this. All of these places especially with the castles and the mountains look so dreamy. How do the insides of the castles look? Every time I see posts on Germany it gets higher and HIGHER on my bucket list! What a beautiful country! I love the name… romantic road! And those houses are so beautiful. What an amazing way to experience the place! How charming! I’ve always wanted to see this part of Germany, and I bet your kids had a ball!